MOPTI, MaliSalif Haidara sat drinking tea on the side of the road with other weary bus passengers when a man with a turban and a long beard approached them: Did they want to become holy warriors? The skinny teen had left his poor hometown in the desert with only the yellow tank top, pants and plastic flip-flops he was wearing. Now Salif was being told he could earn 15,000 francs ($30) a day for himself and 200,000 francs ($400) a month for his family - an enormous sum for a boy who had just turned 16. The car was waiting to take the recruits to a two-week-long training camp in Mali's vast desert, where they would learn how to fire weapons. But the man named Omar made one thing clear. "Once you've taken the money and eaten, it's a done deal," recalled Salif, his troubled face still free of stubble after four days and nights on the bus. "You're there until you die or the war is over." Across northern Mali, Islamists have plucked and paid for as many as 1,000 children from rural towns and villages devastated by poverty and hunger, The Associated Press has found in several dozen interviews with residents, human rights officials, four children or youths and an Islamist official. The AP also saw several other children with machine guns half their size strolling down the streets in Timbuktu, where Westerners can no longer go because of the threat of kidnapping. The interviews shed new light on the recruitment practices of the Islamists, including first-hand accounts of how much money is being offered to poor youth and their families to join. They also provide evidence that a new generation in what was long a moderate Muslim nation is becoming radicalized, as the Islamists gather forces to fight a potential military intervention backed by the United Nations. "We need to intervene rapidly to discourage these people," said Amadou Bocar Teguete, the vice president of Mali's national Human Rights Commission. "The children are innocent and don't know what they are doing, and then they are transformed into criminals." Human Rights Watch says child soldiers are fighting in at least 14 other countries worldwide. Mali, however, was a stable democracy until this year's coup and experts say the recruitment and religious indoctrination of child soldiers here marks a new and ominous development. Child soldiers are being used by all the armed groups operating in northern Mali, but the Islamists, including a militant group known as Ansar Dine, have been among the most prominent recruiters, according to residents and human rights groups. The U.N. children's agency said it has been able to corroborate at least 175 reported cases of child soldiers in northern Mali this year, with parents receiving between 500,000 francs (about $1,000) and 600,000 francs (about $1,200) per child. However, Mali's human rights commission branch in Timbuktu said some families have reportedly received as much as 1 million francs ($2,000). And the AP's interview with Salif suggests some families are promised quite a bit more at $4,800 a year, more than four times the average annual income per person in Mali. Mali human rights officials also put the total number of children recruited by the Islamists considerably higher than U.N. estimates at 1,000, based on accounts from the major cities of Timbuktu, Gao and Kidal. Officials said at least 200 child soldiers are operating in Mali's fabled town of Timbuktu alone. Since a military coup in March that overthrew the country's democratically elected president, Islamists have taken over the north, and nearly half a million people have fled. Many of those who stayed lack the means to leave, and are especially susceptible to cash or in-kind donations. "The Islamists are distributing money and food to their parents, so the children have no choice," said El Boukhari Ben Essayouti, Secretary-General with the Malian Human Rights Association in Timbuktu. "It is poverty and misery that are pushing these children toward them." The practice also takes advantage of a long tradition in western Africa, where parents in rural areas send their children away to the distant cities for an Islamic education, particularly if they have no money to pay for school fees or meals. In the dusty and remote village of Goundam, dotted with mud homes, at least two children under 18 were inscripted into the Ansar Dine militant group back in August. The boys are no longer in contact with their parents, said the deputy mayor of the town of about 13,000 near Timbuktu. The children stay at camps with the militants on the outskirts of towns. 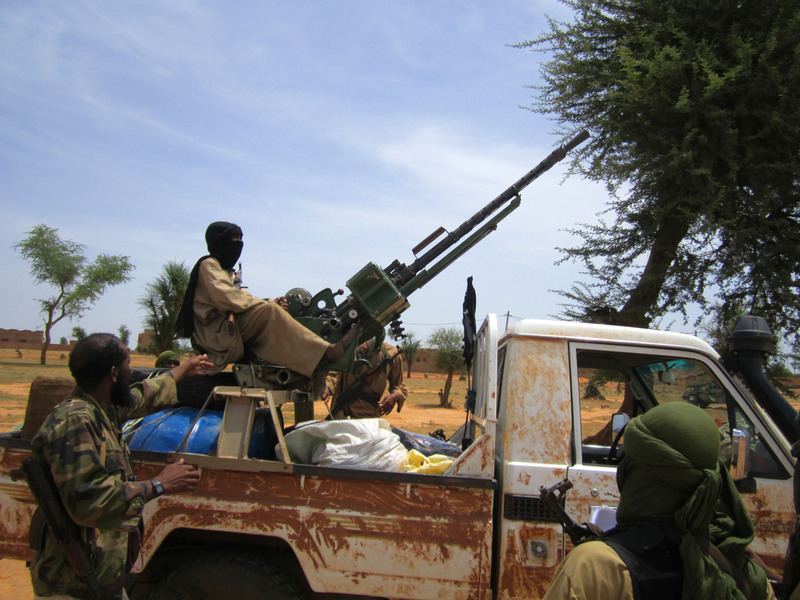 Sadou Diallo, the mayor of the town of Gao, said members of al-Qaida's North Africa branch, known as AQIM, are giving them military training and religious indoctrination. One young Malian who underwent training at a camp run by Ansar Dine confirmed that his instructors were Algerian members of AQIM. "They showed us how to load and unload a weapon, and how to use them in case of attack," said the 20-year-old, who spoke on condition of anonymity for fear of reprisals. "Our instructors told us that during this time all Muslims should know how to defend themselves with arms." The role of the instructors was clear when a Toyota pickup truck stopped on the side of a dusty road in the town of Douentza. The truck carried Abou Dardar, the head of the Islamists in Douentza, and three child soldiers piled into the back. The children did not make eye contact with Dardar and did exactly what he said. One of them, 13-year-old Abdullahi, was looking after his family's animals in the desert only a few months ago. Now he goes by the name of "Abou Konana," in keeping with the tradition of bestowing new "fighter" names upon those who join the Islamists. His head and face were wrapped in a black turban, and his AK-47 dangled from his nose to his knees. When he's not doing military training exercises, he carries a notebook for Quranic studies inside a khaki-colored shirt several sizes too big. "I have only my life to give to God," he told a reporter from The Associated Press. Dardar, a bearded man wearing a camouflage jacket, acknowledged that there are youngsters in the ranks of the militants. But he insisted that his followers were motivated by God, not by signing bonuses. "If they are not, we can't work with them," he said. He turned to Hamadi, a 14-year-old who also worked as a shepherd before coming with his uncle to join the Islamists. The boy now goes by "Bilal," and told the AP that he prefers his new life of jihad to his old one. "I know that there is death, but it's a death because of God," he said. The local head of the Islamists interrupted to remind the boy that the militants believe death will put them next to God. "When we fire our Kalishnikovs, it is not us firing the weapon," he said. "It is God." Back at the bus stop, Salif, the 16-year-old offered money, said several of his friends have joined the Islamists, and some are working as security guards for them. "One friend told me, 'It's a good education. You don't have to work for money. You are working for Islam and for God,'" he said. But Salif turned down the offer. He now lives outside rebel territory in Mopti, and is already hoping that one day the rebels will leave. When they do, he does not want the people of Timbuktu to know him as another child soldier who worked for them. "My parents would not want me taking part in something like that," he said. "And I'm not brave enough to shoot anybody."